We cel­e­brate Christ­mas at our house, but we live in a com­mu­ni­ty in which many cel­e­brate Hanukkah. As we light our Advent can­dles and string our Christ­mas lights, our Jew­ish friends and neigh­bors light the can­dles on their Hanukkah meno­rah and fry deli­cious pota­to latkes. Dear friends invite us to join them for one of the Hanukkah nights each year and we are blessed to have the fla­vors of fried pota­toes, jel­ly donuts, sour cream, and apple­sauce min­gle with our cin­na­mon, car­damom, Christ­mas gin­ger­bread fla­vors. When my kids were lit­tle, we always checked out Hanukkah pic­ture books from the library so they’d have some con­cept of the hol­i­day before stuff­ing them­selves with latkes. There were always many to choose from, though many of them were old­er well-loved books. One of those has recent­ly been redone. The Chanukkah Guest by Eric Kim­mel was orig­i­nal­ly pub­lished by Crick­et Mag­a­zine and then lat­er made into a pic­ture book with Gio­ra Car­mi as illus­tra­tor. 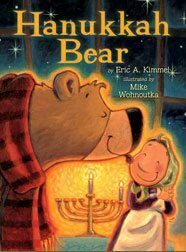 Last year, a new ver­sion appeared on the shelves—Hanukkah Bear. The sto­ry is the same (and still writ­ten by Eric Kim­mel), but the text is tighter and the illus­tra­tions are new. Illus­tra­tor Mike Wohnout­ka turns out to be an inspired match for Kimmel’s sto­ry­telling. This delight­ful sto­ry is enjoy­ing a revival now—and the author and illus­tra­tor are still kvel­ling over receiv­ing the Nation­al Jew­ish Book Award. Now, the read­er under­stands through Mike Wohnoutka’s illus­tra­tions that the rab­bi is not the rab­bi at all—it is Old Bear! But Bub­ba Bray­na does not see or hear well, so she inter­prets the size and shape of her guest, as well as his growls and grum­bles, to be that of her dear rab­bi. They light the can­dles on the meno­rah, Old Bear grum­bles and mut­ters the bless­ing, they play drei­del games, and eat latkes. Even­tu­al­ly, the mix-up is revealed—the vil­lage and the real rab­bi (look­ing very much like Old Bear) arrive. Bub­ba Bray­na has a good laugh and all her friends help make more latkes. Light, love, and laugh­ter fin­ish off the book. This book has the hon­or of being a PJ Library book (think Read­ing Rain­bow for Jew­ish chil­dren and their fam­i­lies), but I think it works excep­tion­al­ly well for non-Jew­ish chil­dren, too. The par­ty at Bub­ba Brayna’s is very like the one we attend each year, and both a recipe and a Hanukkah expla­na­tion are includ­ed in the end papers. It’s the per­fect book for shar­ing in a sto­ry­time about the dif­fer­ent hol­i­days this time of year.